Here We Go Magic are a difficult band to quantify. In essence, they’re guitar-based indie, but their sound is much more than that; it’s full of experimentation, build-up, loops, wonky beats and almost all of the components you would usually expect in some of the more left-of-field dance acts.Thom Yorke from Radiohead was reported as saying that Here We Go Magic were his favourite band at Glastonbury 2010. Their live act plays out like a jamming session, with sounds developing throughout their tracks as impromptu and free-form as if they were making it up as they go. They are effortless in their invention. Their self-titled début album created a blueprint for what was to come. Home recorded on four-track, as a solo project for lead singer Luke Temple, it featured a taste of the soundscapes that would become their trademark. After the success of the début, Temple recruited a band and released ‘Pigeons’ in 2010. This record had a lot more production, even more ideas and was critically acclaimed as one of the best albums of 2010. Their new offering ‘A Different Ship’ has a lot to live up to. Having seen Here We Go Magic live a couple of times, I can imagine they would be a difficult act to record, given the hugely layered sound they generate. For ‘A Different Ship’, long-term Radiohead producer Nigel Godrich is drafted in on production duties and proves to be an excellent choice. On first listen, you can hear instantly the upgrade in clarity from their previous two outings. For a record as noisy as this, and with so much going on, it’s been blessed with one of the best productions I’ve heard in a long time. None of their sound is lost. The vocal and guitar layers are so defined that my first reaction was to go out and upgrade my headphones so that I could take it all in. First track ‘Intro’, as its title suggests, is a drum warm-up, with screaming backing vocals. It’s short-lived and we’re straight into country-sounding ditty ‘Hard To Be So Close’ with its odd chord changes and subtle build up. You can feel that we’re being eased in. The build-up is slow and the layered guitar melodies are beautifully complementary to the vocal. It’s a delicious opener. ‘Make Up Your Mind’ shifts the tempo up with a rockabilly groove overlayed with hushed vocals. The central riff builds and builds, becoming looped, before periodically dropping out as more sounds are added to the mix. Relentless drums never change tempo and only synth and vocal can soften its hard edge. I expect this would be one of the highlights of their live act. It’s a heady mix, culminating in a huge kaleidoscopic soundscape. Towards the end of the track it has almost crossed over into Trace music. It’s mesmerising stuff. A more traditional songwriting style is regained for downbeat, Low-esque ‘Alone But Moving’. The whole album is full of catchy hooks but this one will stay with you for days. Vocals are immaculately mixed against minimal drum and guitar backing. It’s a track that could run for twice the duration and you would still want to bask in it for longer. Mid-album ‘I Believe in Action’ is an out-and-out dance track with syncopated drumming and a looped, wonky guitar riff from the outset. At odds with the tempo, the vocals here (oddly) reminded me of mid-eighties Paul Simon, which gives it an unexpectedly retro feel. Of everything on offer here, this is by far the most expansive track on the album. It creates a huge wall of noise which hangs together perfectly, without ever losing its hook. ‘Made To Be Old’ is a low-key blues workout. Everything is turned down to emphasise the reverb vocal. It moves along at a relaxed tempo and almost forces you to find its hidden grooves. It’s subtle and sublime, a hidden gem in the chaos. Single release ‘How Do I Know’ is pure pop, with a chorus so catchy it’s difficult to shift. This is the most accessible track on the album and manages to encapsulate all of the themes and sounds on offer so far, while packing them into one easy-to-swallow track. It’s beautifully structured and brimming with chipper guitar and soaring vocals (complete with ‘wooting’ chorus). I have no doubt this will be an indie club floor filler for a few years to come. Title track ‘A Different Ship’ closes the album and is its crowning glory. A beautiful ballad, featuring an amazing vocal from Luke Temple, the track is wrapped in a smooth low-key eighties-tinged production, which complements Temple’s voice perfectly. It actually reminded me of something approaching the likes of Cat Stevens or Christopher Cross. The track runs for around four minutes before dissolving into an ambient buzz for the remainder of the playing time. It’s a reminder that things are never what they seem for this band. 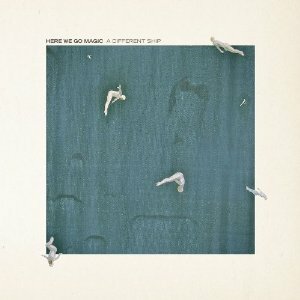 It feels as if having experimented with various musical directions and structures on their previous outings, Here We Go Magic have decided to channel their sound into more distinct, manageable pieces. They have the ability to skip across genres effortlessly but now have enough control to know when less could be more. While previously you could hear the genius lurking within their tunes amidst the multitude of ideas, here their sound is much more accessible. Also I find it can become too easy to be preoccupied with their musical structures but Temple’s vocals should not go without note; throughout the whole record they are immaculate and Luke Temple is a hugely talented front man. Having lived with the album for a couple of weeks now, I have played little else. It’s a beautiful record that deserves a lot of repeat listening. ‘A Different Ship’ will catapult Here We Go Magic into the mainstream and I have no doubt it will become an important album in 2012. This entry was posted in Here We Go Magic and tagged A Different Ship, Here We Go Magic by admin. Bookmark the permalink.